See how you match up against your local community, earn prizes, and become a champion in this unique day of competition taking place all around the world! For more information, click on over here. Many Game Stores run organised tournaments or 'league events'. Find a local store here and ask. 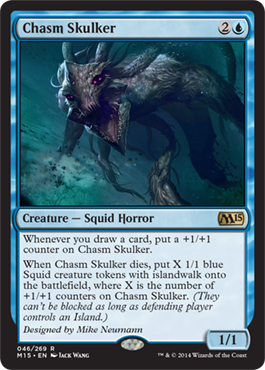 The League promo card is this lovely Squid Token, which is generated by the M15 card Coral Barrier. Here in Canada-Land, most people have taken today off as tomorrow (June 1st) is Canada Day, making it an epic four-day long weekend. Speaking of weekend, we hope yours went very well and you had a chance to get in some Magic: the Gathering games. 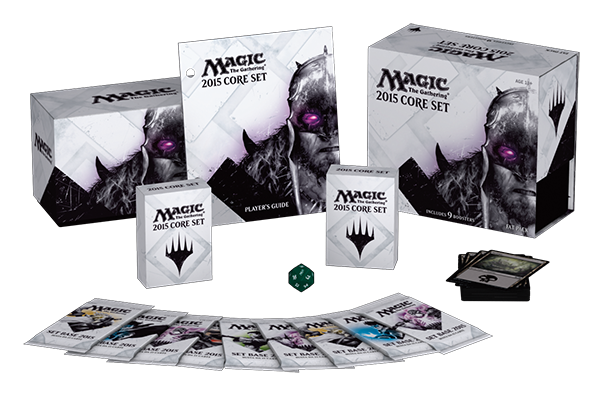 Next weekend (12th July) is the much anticipated Magic 2015 core set prerelease event with the release following on Friday 18th. Look for our coverage of these events at OMG! Games here in Barrie, Ontario. We are constantly updating our M15 spoiler list page so drop by often, and now is a good time to start organizing your M15 pre-orders at MTG Mint Card. 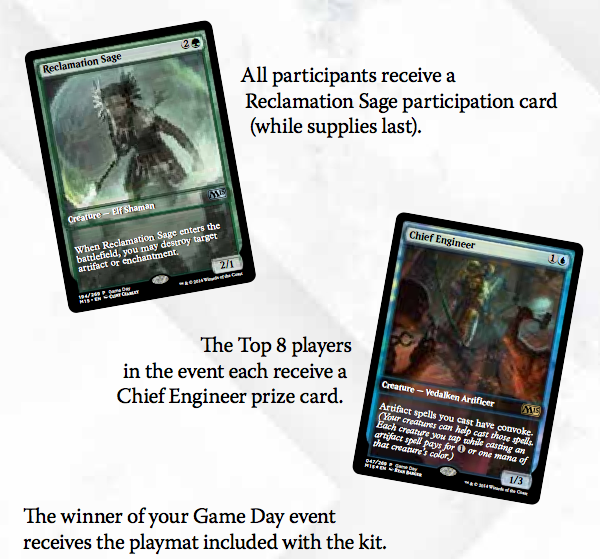 Anywhoos - let's get on with today's M15 previews ! 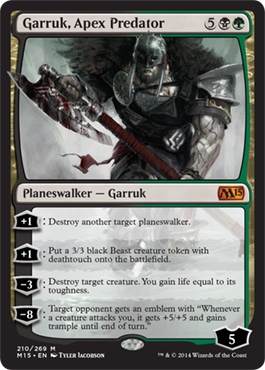 [+1]: Destroy another target planeswalker. 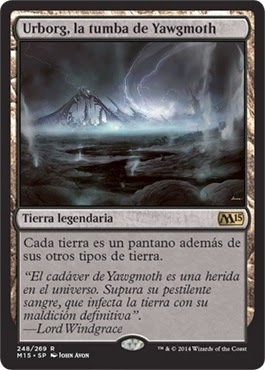 [+1]: Put a 3/3 black Beast creature token with deathtouch onto the battlefield. 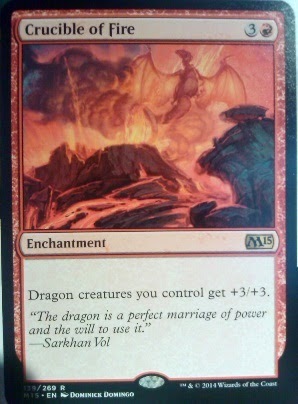 [-3]: Destroy target creature. You gain life equal to its toughness. 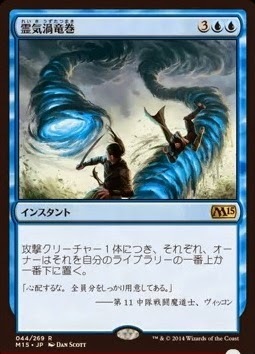 [-8]: Target opponent gets an emblem with "Whenever a creature attacks you, it gets +5/+5 and gains trample until end of turn." Wait. Wut? Yep - four abilities and there's two plus. There is little doubt that this card will make a significant impact on your game when it hits 'n' sticks on the battlefield. For each attacking creature, its owner chooses to put it on the top or bottom of his or her deck. Damn nice removal here. 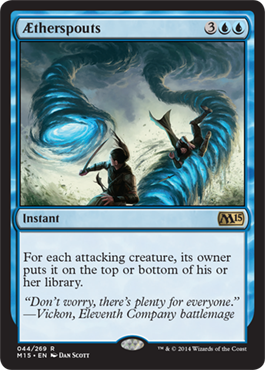 We're thinking that perhaps this is better than the Tenth Edition 'Evacuation' as you would keep this in hand until your opponent alpha-strikes you, leaving the board open for your attack. 1B, Discard a creature card: Draw a card. 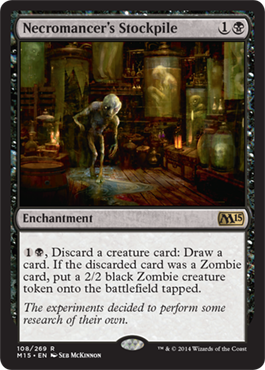 If the discarded card was a Zombie card, put a 2/2 black Zombie creature token onto the battlefield tapped. 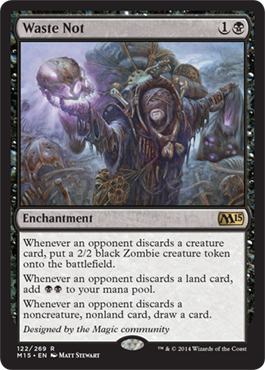 This early two-drop enchantment may be a solid choice in that zombie decklist you've been wanting to build. Paying two and discarding a 1/1 zombie nets you a 2/2 token and an extra card - yes please. THIS! Has us very rather excited. This reprint from Ravnica was wildly popular and there is little doubt that players will be building standard constructed decklists with this again. 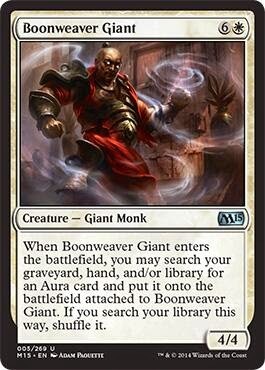 When Boonweaver Giant enters the battlefield, you may search your graveyard, hand and/or library for an Aura card and put it onto the battlefield attached to Boonweaver Giant. If you search your library this way, shuffle it. 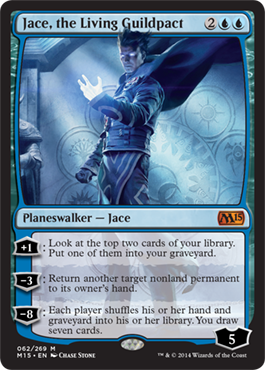 Not all that terrible - especially if you can ramp into it and tutor an powerful (high-costed) aura singleton from you library. Actually we're employing a prevarication (see the doubting Decreux reference to the right) - it's actually still Thursday at around 9:00 PM (EST) but apparently there was a screw-up on the mothersite and all of Friday's articles were promoted early - which means early Magic 2015 previews for all those Magic: the Gathering spoiler-nutters like us (and most likely you as well since you keep coming here). 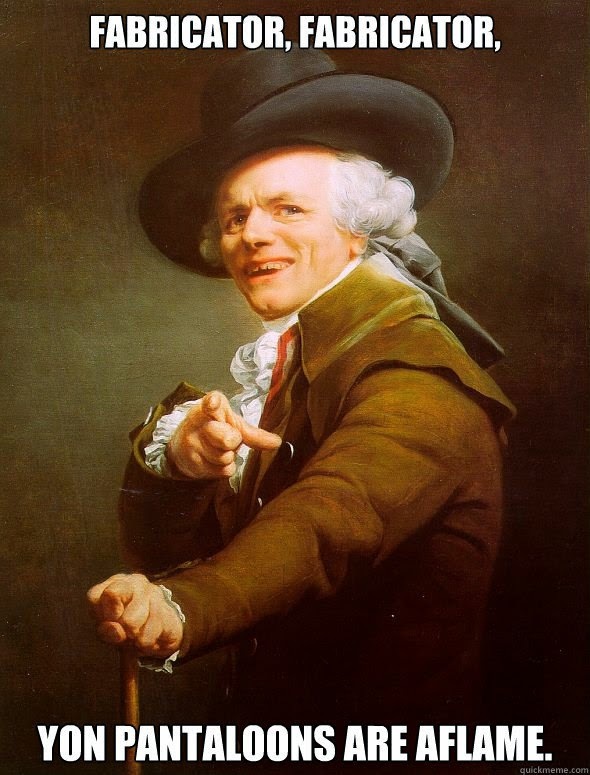 Anywhoos, as you may in all liklihood be reading this on Friday, the point here may be moot. Make sure to kill two birds with one stone as the barbaric saying goes and head on out to a Friday Night Magic event not only to get your game on but also to socialize (to better fit in with the other humans around you). We'll be at our local gaming store, OMG! Games here in Barrie, Ontario, Canada which fortunately has been spared any tornado damage. 'Nuff said, let's get to the new cardboard ! 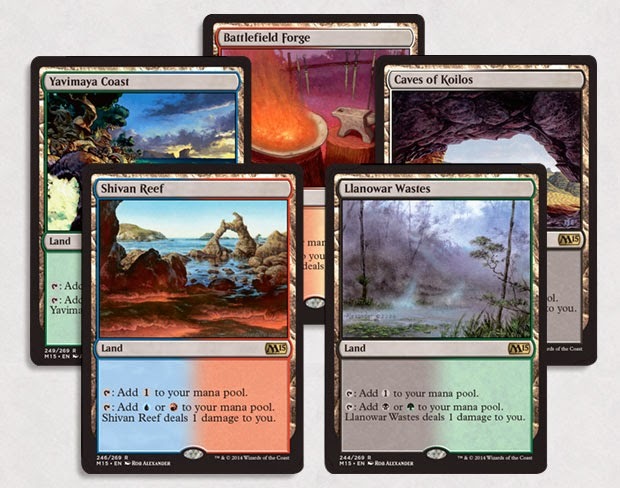 Big news - We've got our rare cycle of lands back in the set, which is awesome since the last core set did not have any. 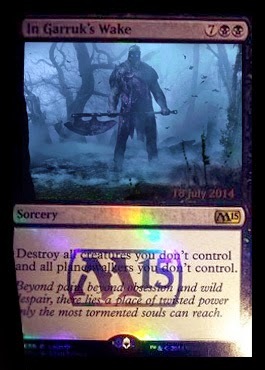 Last seen print in Tenth Edition, these enemy coloured 'pain lands' might still be found at your local store or online retailer like MTG Mint Card. 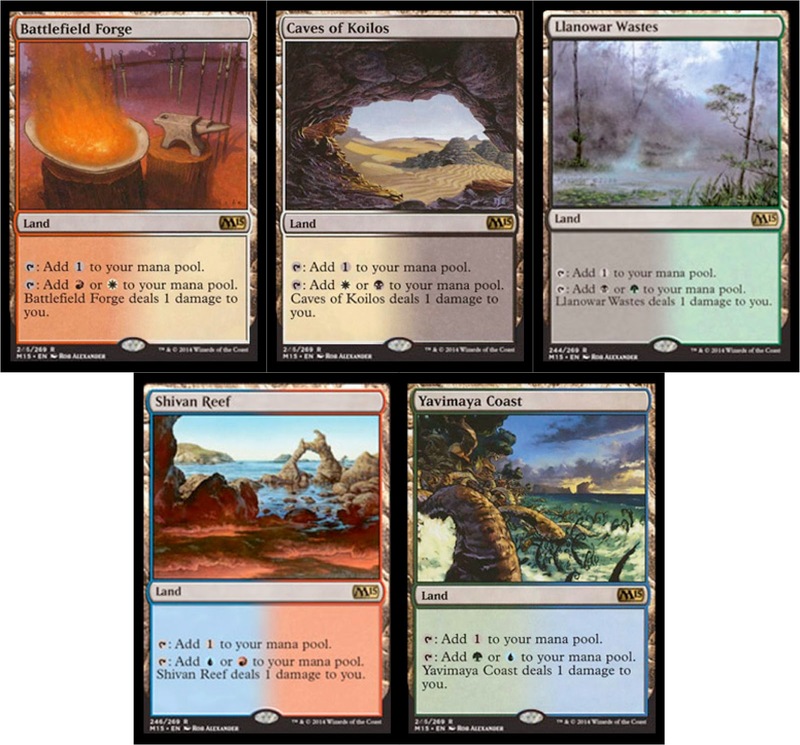 Enemy colored painlands: Rare dual lands with "Tap: Add 1 to your mana pool. Tap.gif: Add E or F to your mana pool. 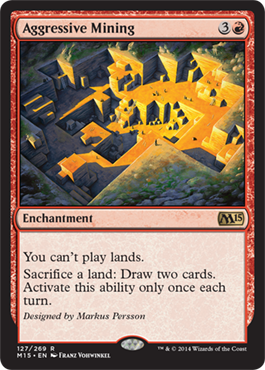 [This land] deals 1 damage to you." E and F are enemy colors of mana. 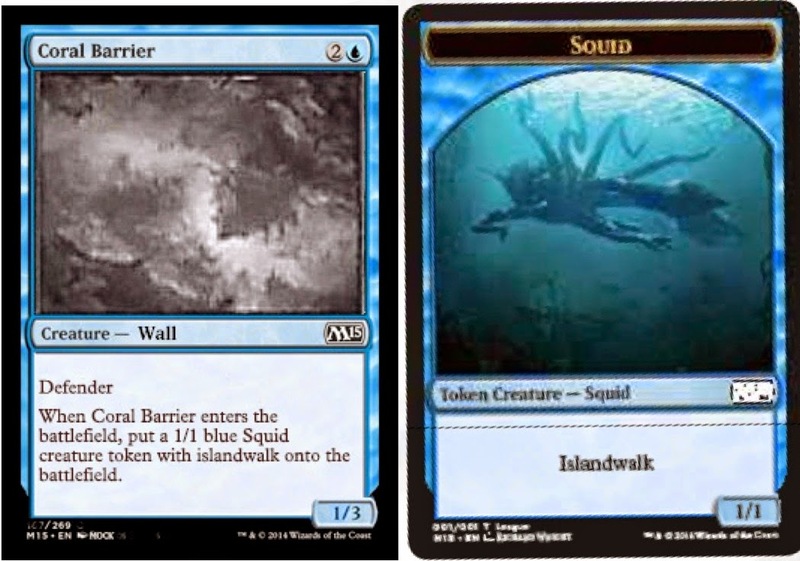 The mana in the core set is really weirding us out - Urborg, Tomb of Yawgmoth, Sliver Hive, and then these guys. Look at the top two cards of your library. Put one of them into your graveyard. [-3] Return another target non land permanent to its owner's hand. [-8] Each player shuffles his or her hand into hero or her library. You draw seven cards. Much meh is contained within this card. Not quite standard playable with the exception of perhaps an odd sideboard card maybe. We would rather just play Torpor Orb. Modern however, this this is looking good. 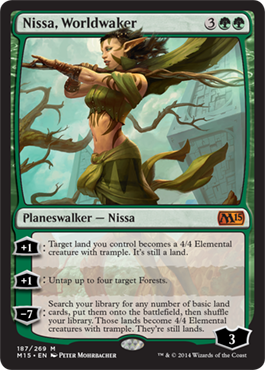 Card draw for green is always most welcome and we see no reason why this won't be popular in standard. 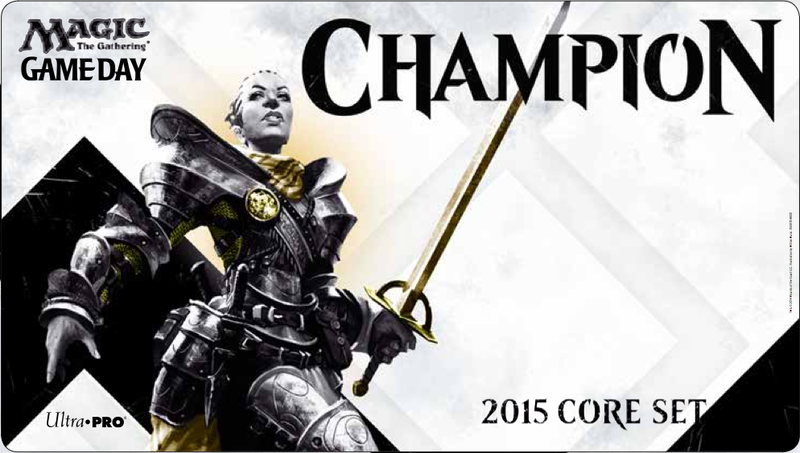 If your game is Magic: the Gathering and you've come here for more coverage of Magic 2015 core set spoilers 'n' previews, then you've come to the correct place. Some recent M15 related posts which are not new cards may have escaped your attention - here's the post on all the new Ultra•PRO M15 product line up, over here is the post on the M15 product packaging, for which we have all the new cards revealed with the exception of Jace and the cursed Garruk. 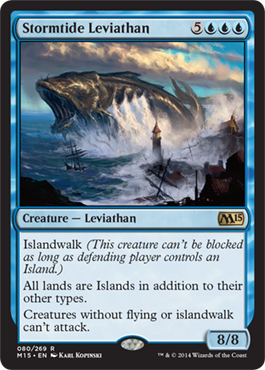 Rumor has it that LSV over at Channel Fireball will be previewing this latter this evening. 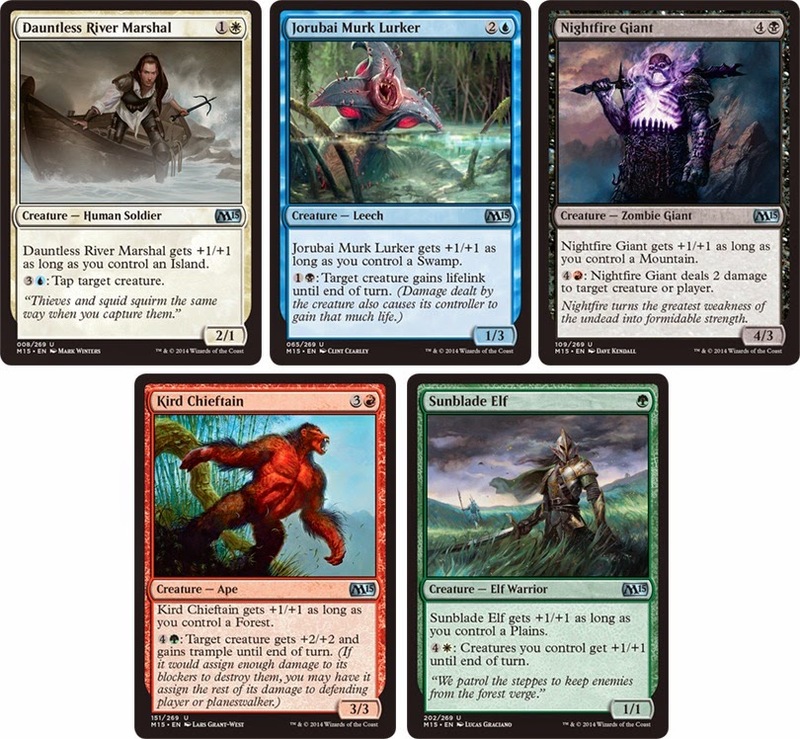 If you've missed any of the recent cards, we have these all updated on the Magic 2015 Spoiler List over here. 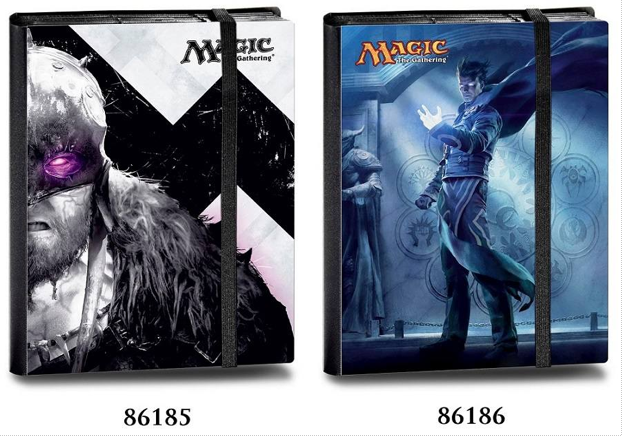 A heads-up to those wanting to pre-order assorted M15 lots at a decent price - pop on over to MTG Mint Card and catch the early pre-order discount before its gone. Anywhoos - lets get to the new cards ! 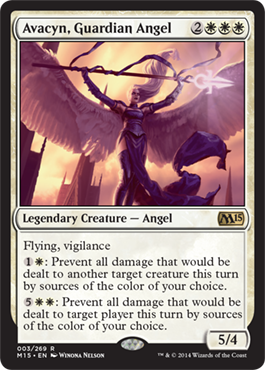 Not sure just what happened to Avacyn on here trip from Innistrad to M15 but we were kinda expecting more with a card that had her name on it. 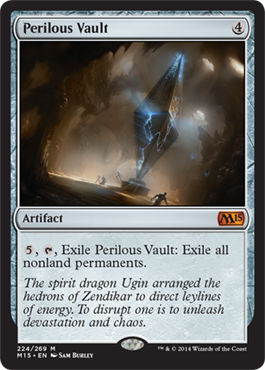 Weird that Avacyn was trapped in a vault on Innistrad and that a Perilous Vault was previewed on the same day. 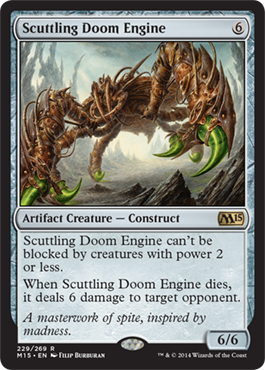 This card looks interesting and we'll likely get this in a few decklists. 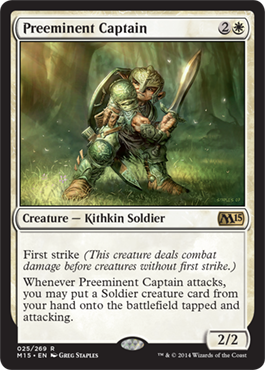 Whenever Preeminent Captain attackes, you may put a Soldier creature card from your hand onto the battlefield tapped and attacking. One of our fav Kithkin from back in the day - and yes, we still have a deckset of this solid card still. Wow. Did you know that Crypt Ghast is still in standard for another little while. 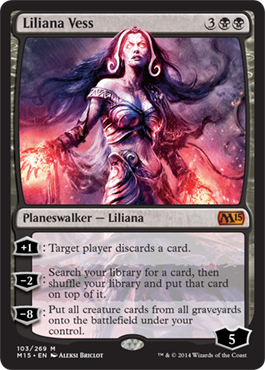 Also Liliana of the Dark Realms is leaving and likely for a good reason. Yet another reprint but we are kinda pumped for this. The current standard environment could likely use a hoser card like this to get things exciting. 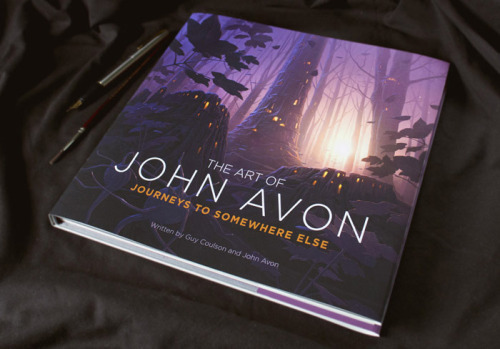 To celebrate 30 years of producing beautiful fantasy art for books, record covers and card games, John Avon, with his agent Guy Coulson, is putting together his collected works book, ‘Journeys to Somewhere Else’. John Avon (born 1961 in Cardiff, Wales) is a fantasy and science fiction illustrator. His work has been used for book covers, CD covers, games, toys and advertising campaigns. He is best known for his artworks for the collectible card game Magic: The Gathering, of which he has produced over 200 paintings. 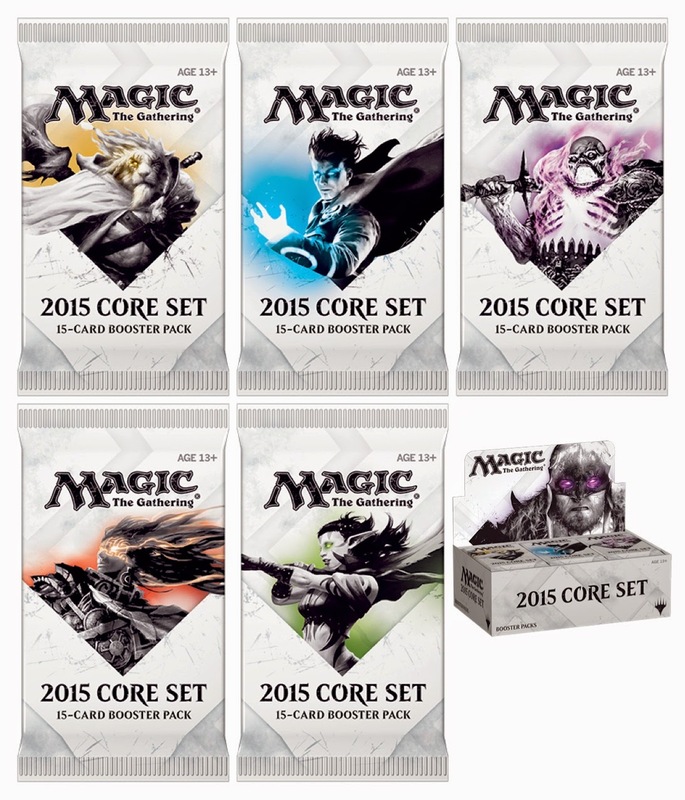 Second, and lastly - All the very cool Ultra PRO products for the Magic 2015 core set. ULTRA PRO has been designing, manufacturing, and distributing gaming and collectibles accessories since 1952. 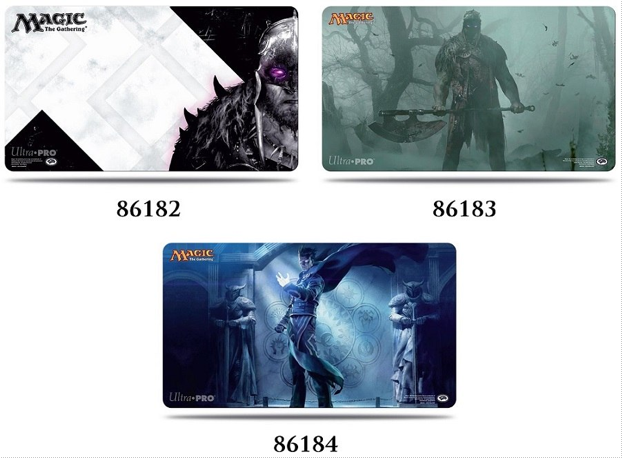 They are recognized as the premier brand of protection and display products within the trading card game (TCG) and sports trading card industries. Look for Ultra PRO products at your local gaming store and MTG Mint Card. 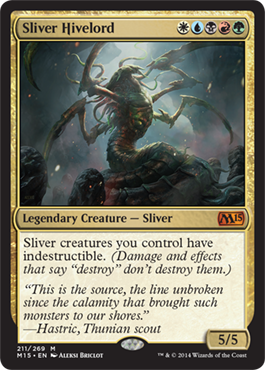 We are attempting to keep up with the blistering pace of Magic: the Gathering spoilers and previews this week and although there have been a few that have come over the wire, rest assured, that we've caught them all on our Magic 2015 Spoiler List. 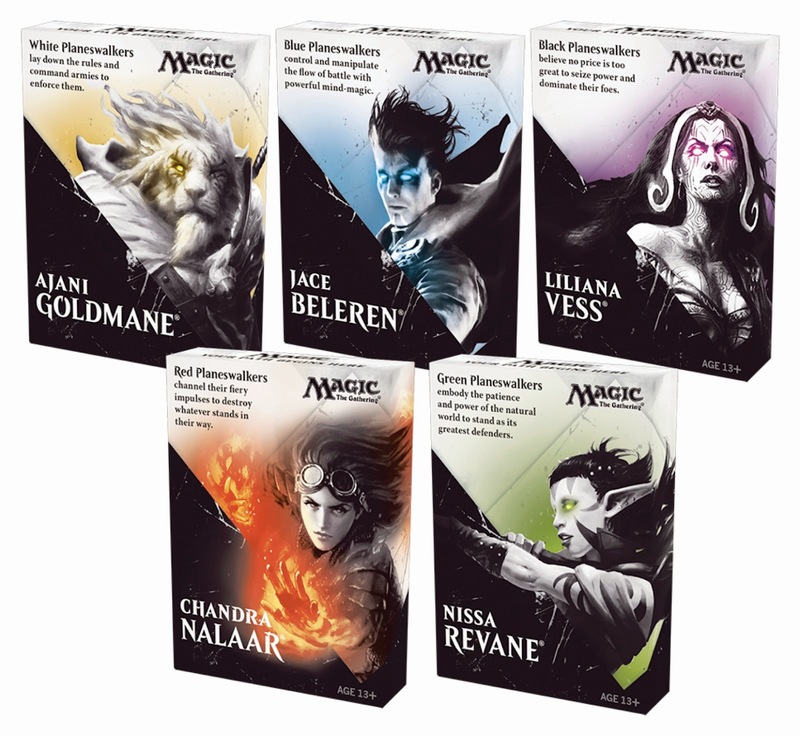 There has been an indication from MaRo that we can expect SIX planeswalkers in this core set - a new Ajani (white), Jace (blue), a reprinted Liliana Vess (black), a reprinted Chandra Pyromaster (red), a new Nissa (green), and in all liklihood, a black-green Garruk. 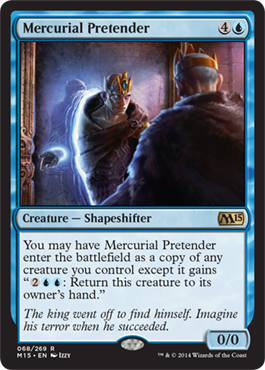 If you already have the reprints, you're good to go, if not, pop over to MTG Mint Card and pick 'em up today. 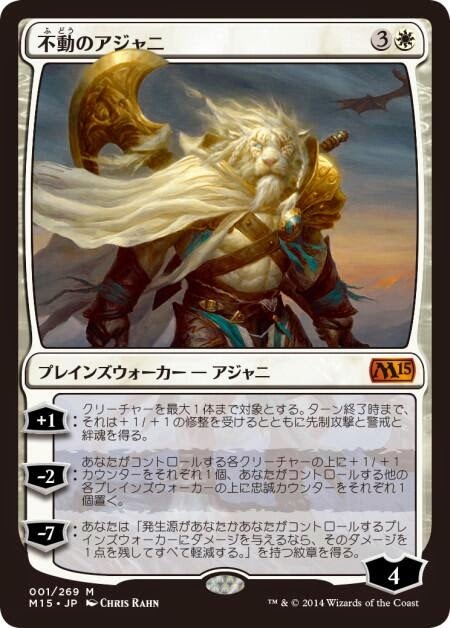 In a latter article, we'll yatter about what we think about these new cards. Anywhoos, Let's get to them now! [+1]: Up to one target creature you control gets +1/+1 and gains lifelink, first strike, and vigilance until end of turn. 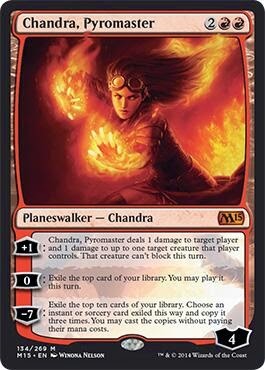 [-2]: Put a +1/+1 counter on each creature you control, then put a loyalty counter on each other planeswalker you control. [-7]: You get an emblem with "If damage would be dealt to you or a planeswalker you control, prevent all but 1 of that damage." 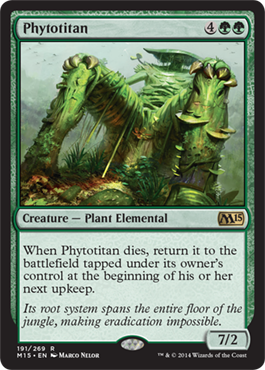 4WW: Creatures you control get +2/+2 and gain first strike and lifelink until end of turn. 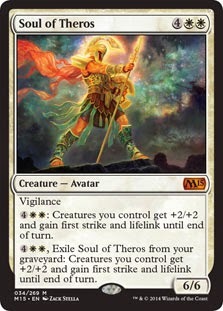 4WW, Exile Soul of Theros from your graveyard: Creatures you control get +2/+2 and gain first strike and lifelink until end of turn. 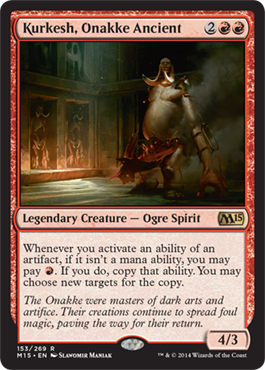 Today on the mothersite, there was also a new creature cycle revealed, based upon the older Sedge Troll card where the creature gets +1/+1 if you control a basic allied colour land and has an activated ability using that colour. 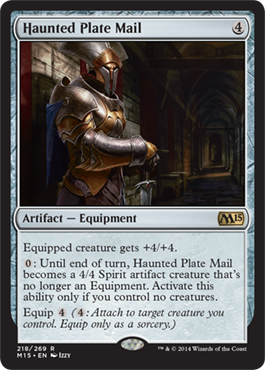 Before we get into more Magic 2015 core set spoilers and previews, we wanted to get to some housekeeping and get posted some 4.1.1. on some of the M15 product offerings and packaging. 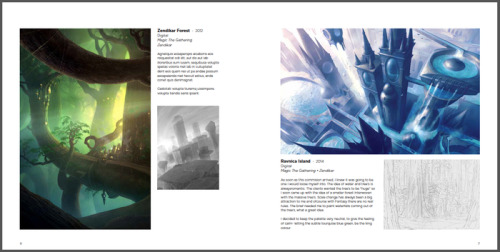 These posts are always of interest as we get a glimpse of some yet unknown card illustration - sometimes it pretty obvious (in the case of perhaps a Planeswalker) and sometimes not so much. 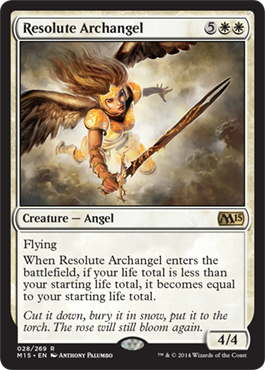 Be sure to catch up with the latest M15 spoilers and previews over here on the Spoiler List Page which is now at 160 of 269 cards revealed. 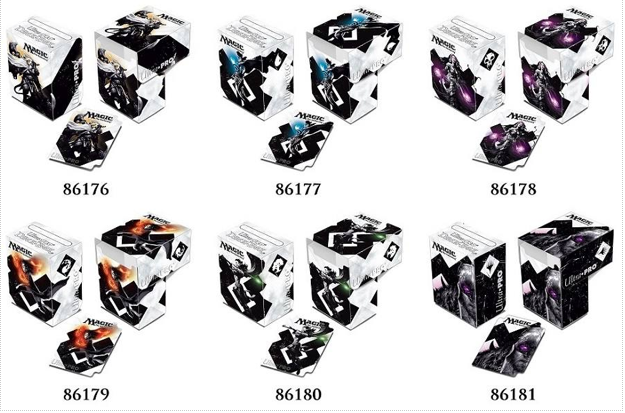 Anwywhoos, here's the product packaging pics - and remember, if can easily upgrade most any product into a fine gaming weapon with additional singles from MTG Mint Card. Each Booster Box will contain 36 booster packs. 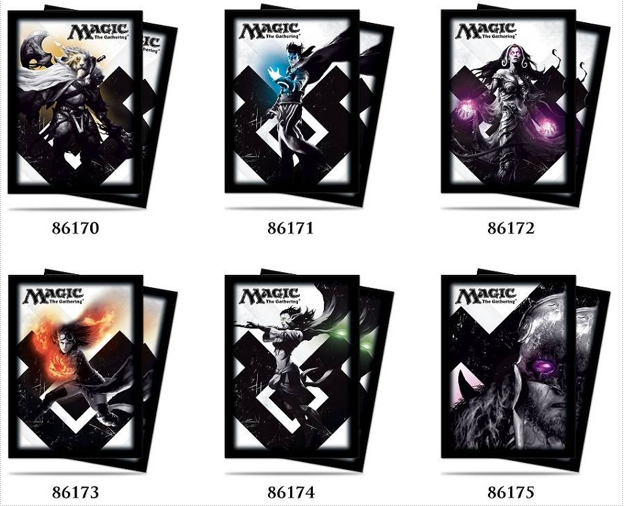 There are Five different decks 30 cards per pack, typically with 13 lands, 10 or 11 creatures and 6 or 7 other spells. These are typically handed out as swag, at conventions or by local gaming stores to introduce new players to the game. Decklists are here. ALL INFORMATION BELOW IS UNOFFICIAL - REFER ONLY TO THE WIZARDS OF THE COAST WEBPAGE FOR OFFICIAL PREVIEWS. Exile target attack or blocking creature. When Kinsbaile Skirmisher enters the battlefield, target creature gets +1/+1 until end of turn. Enchanted creatures gets +2/+2 and has vigilance. Creatures you control get +2/+1 until end of turn. 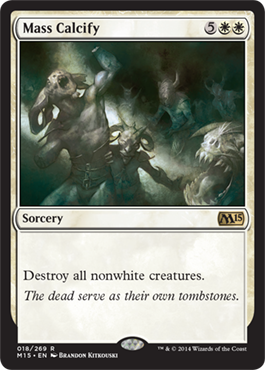 White creatures you control also gain first strike until end of turn. 1W, Sacrifice Selfless Cathar: Creatures you control get +1/+1 until end of turn. T: You gain 1 life. Enchanted creature gets +2/+2 and has protection from all colors. This effect doesn't remove auras. 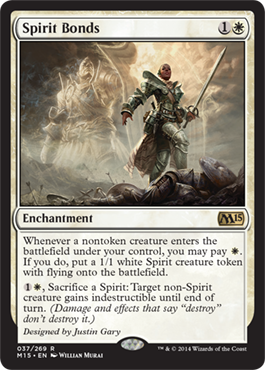 Whenever a nontoken creature enters the battlefield under your control, you may pay W. If you do, but a 1/1 white Spirit creature token with flying into play. 1W, Sacrifice a Spirit: Target non-Spirit creature you control gains indestructible until end of turn. Aeronaut Tinkerer has flying as long as you control an artifact. 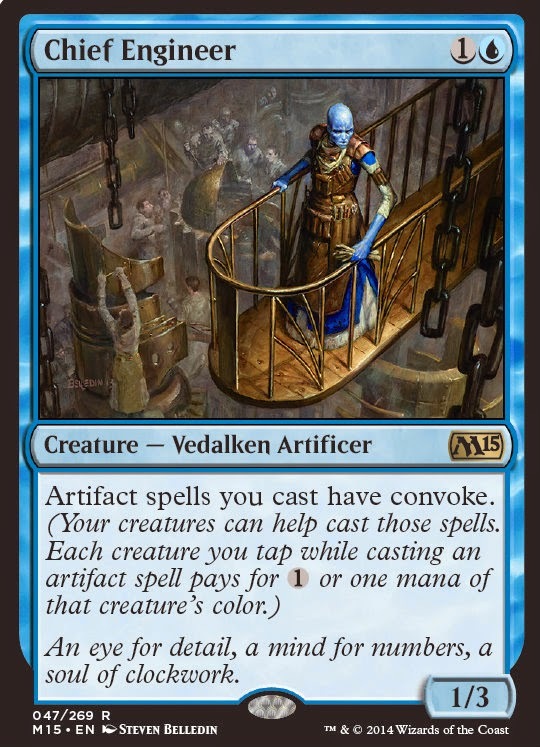 Artifact spells you cast have convoke. 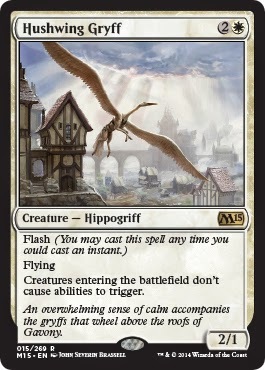 Whenever a Sliver creature you control becomes the target of a spell or ability an opponent controls, counter that spell or ability unless its controller pays 2. Glacial Crasher can't attack unless there is a Mountain on the battlefield. 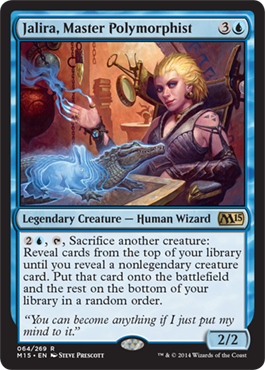 3U, T, Sacrifice another creature: Reveal cards from the top of your library until you reveal a nonlegendary creature card. Put that card onto the battlefield and the rest on the bottom of your library in a random order. 1B: Target creature gains lifelink until end of turn. 3U, T: Draw a card, then discard a card. 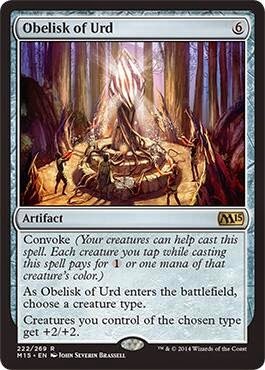 5UU: Draw a card for each color among permanents you control. 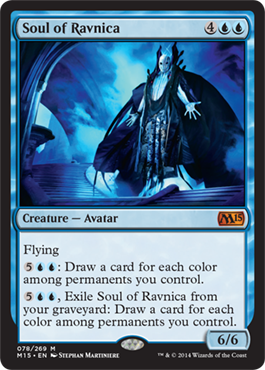 5UU, Exile Soul of Ravnica from your graveyard: Draw a card for each color among permanents you control. 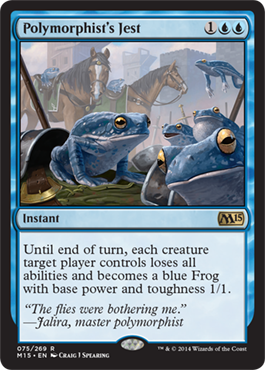 Target creature loses all abilities and becomes a 1/1 blue Frog until end of turn. 1B, Sacrifice another creature: Put a +1/+1 counter on Blood Host and you gain 2 life. 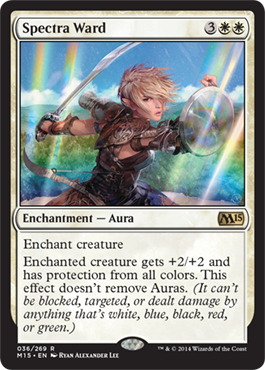 2B, T, Remove X +1/+1 counters from Cruel Sadist: Cruel Sadist deals X damage to target creature. Enchanted creature has lifelink and "Whenever a creature an opponent controls dies, put a +1/+1 counter on this creature." 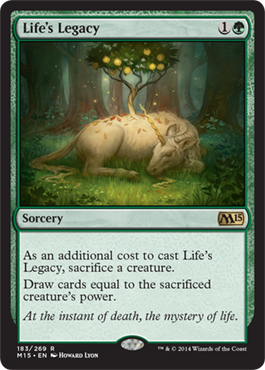 At the beginning of each upkeep, if an opponent lost life this turn, put a +1/+1 counter on each creature you control. Nightfire Giant gets +1/+1 as long as you control a Mountain. 4R: Nightfire Giant deals 2 damage to target creature or player. When Necromancer's Assistant enters the battlefield, put the top three cards of your library into your graveyard. Whenever you gain life, put a +1/+1 counter on Wall of Limbs. 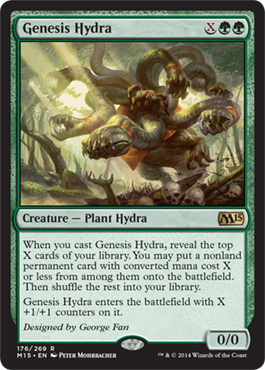 5BB, Sacrifice Wall of Limbs: Target player loses X life, where X is Wall of Limbs's power. 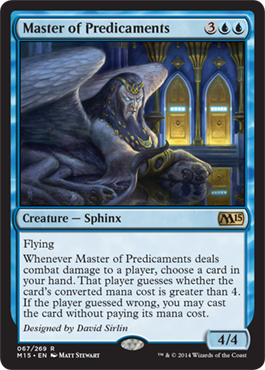 3B: Until end of turn, Xathrid Slyblade loses hexproof and gains first strike and deathtouch. Exile the top three cards of your library. Until end of turn, you may play cards exiled this way. Whenever a creature an opponent controls dies, Altac Bloodseeker gets +2/+0 and gains first strike and haste until end of turn. 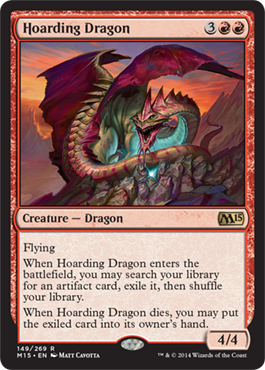 Whenever an Aura becomes attached to Brood Keeper, put a 2/2 red Dragon creature token with flying onto the battlefield. It has "R: This creature gets +1/+0 until end of turn." T, Sacrifice Generator Servant: Add 2 to your mana pool. If that mana is spent on a creature spell, it gains haste until end of turn. 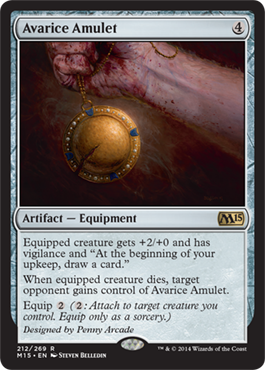 At the beginning of your upkeep, put a colorless artifact token named Land Mine onto the battlefield with "R, Sacrifice this artifact: This artifact deals 2 damage to target attacking creature without flying." Then flip a coin. 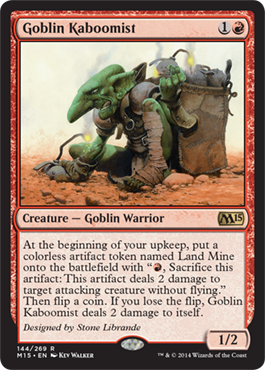 If you lose the flip, Goblin Kaboomist deals 2 damage to itself. 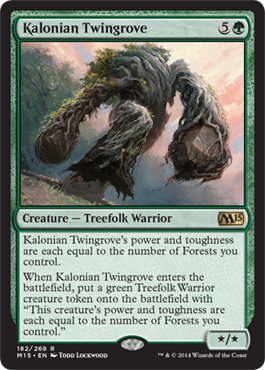 Kird Chieftain gets +1/+1 as long as you control a Forest. 4G: Target creature gets +2/+2 and gains trample until end of turn. Whenever you activate an ability of an artifact, if it isn't a mana ability, you may pay R. If you do, copy that ability. You may choose new targets for the copy. At the beginning of combat on your turn, if you control all creatures with the greatest power on the battlefield, gain control of target creature until end of turn. Untap that creature. It gains haste until end of turn. 2R: Miner's Bane gets +1/+0 and gains trample until end of turn. 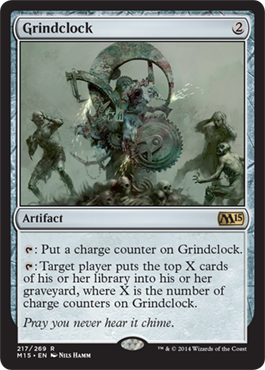 As long as you control an artifact, Scrapyard Mongrel gets +2/+0 and has trample. 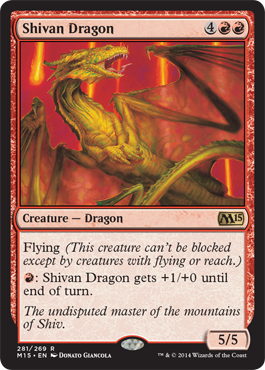 Whenever Siege Dragon attacks, if defending player controls no Walls, it deals 5 damage to each creature without flying that player controls. 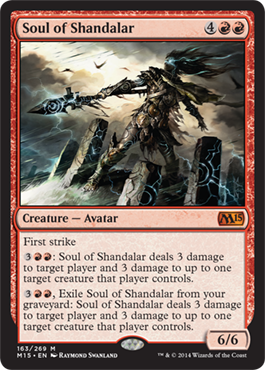 3RR: Soul of Shandalar deals 3 damage to target player and 3 damage to up to one target creature that player controls. 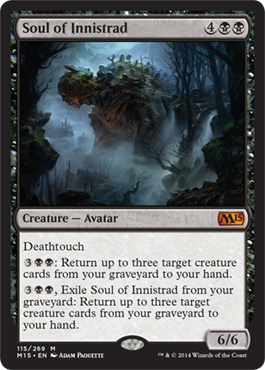 3RR, Exile Soul of Shandalar from your graveyard: Soul of Shandalar deals 3 damage to target player and 3 damage to up to one target creature that player controls. 5GG: Put a +1/+1 counter on Carnivorous Moss-Beast. 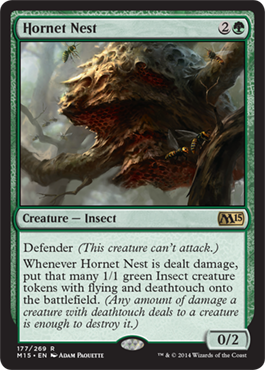 When Hornet Queen enters the battlefield, put four 1/1 green Insect creature tokens with flying and deathtouch onto the battlefield. 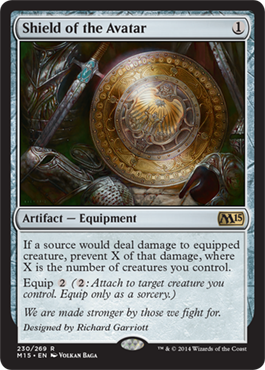 Prevent all combat damage that would be dealt by nongreen creatures this turn. Whenever Netcaster Spider blocks a creature with flying, Netcaster Spider gets +2/+0 until end of turn. Target creature you control gets +1/+1 and gains hexproof until end of turn. When Shaman of Spring enters the battlefield, draw a card. 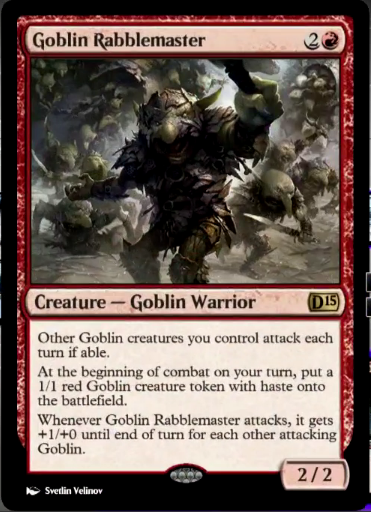 3GG: Put a 3/3 green Beast creature token onto the battlefield. 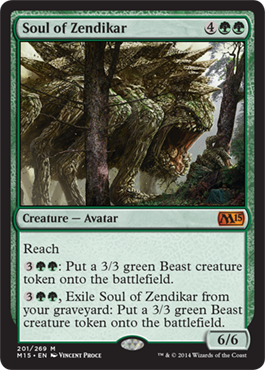 3GG, Exile Soul of Zendikar from your graveyard: Put a 3/3 green Beast creature token onto the battlefield. 4G: Return Vineweft from your graveyard to your hand. 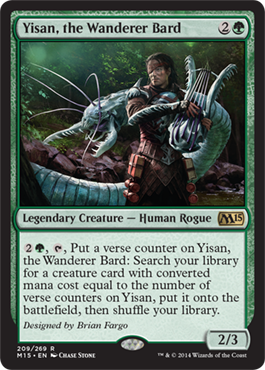 2G, T, Put a verse counter on Yisan, the Wanderer Bard: Search your library for a creature card with converted mana cost equal to the number of verse counters on Yisan, put it onto the battlefield, then shuffle your library. Equipped creatures gets +2/+2 and has trample. 3: Until end of turn, Gargoyle Sentinel loses defender and gains flying. 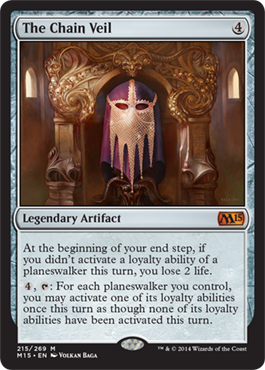 4, T: For each planeswalker you control, you may activate one of its loyalty abilities once this turn as though none of its loyalty abilities had been activated this turn. T: Add one mana of any color to your mana pool. Spend this mana only to cast a Sliver spell. 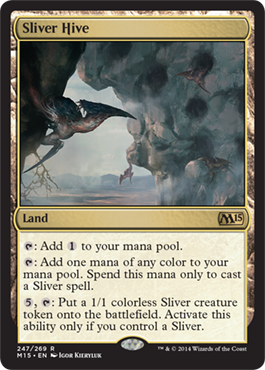 5, T: Put a 1/1 colorless Sliver creature token onto the battlefield. Activate this ability only if you control a Sliver.